The easiest ever crock pot fudge recipe. 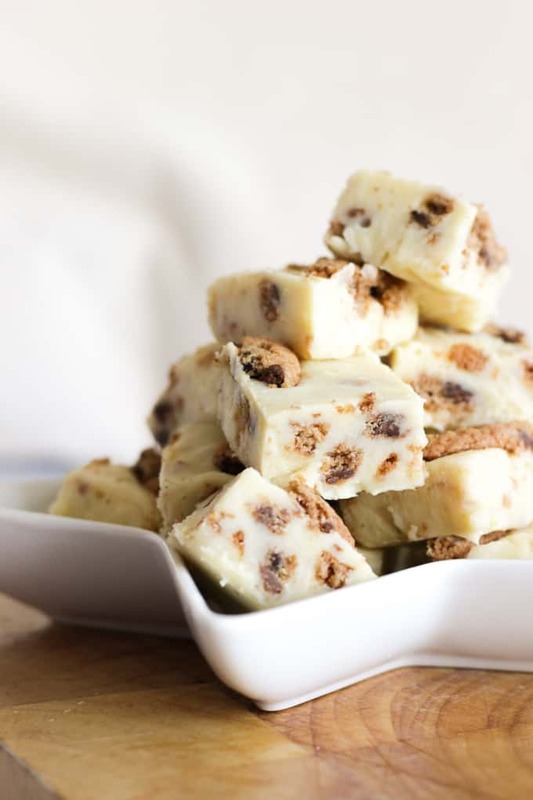 This Cookies and Cream Slow Cooker Fudge is the perfect homemade gift, packed with chocolate and condensed milk. Simple and delicious. Yes my friends, it’s almost that time of year. The time when the festive season thoughts start to creep in. I know, Christmas in the shops already blah blah. It is a bit much. But, with me being an obsessive planner, in a few weeks, when Halloween is over, my festive lists will start. Last year I made piles of Slow Cooker Fudge to give as gifts, for teachers, friends, our long suffering postman. It is so super easy and really impressive when packaged up in pretty cellophane bags. The children absolutely loved helping me make it (and test it). 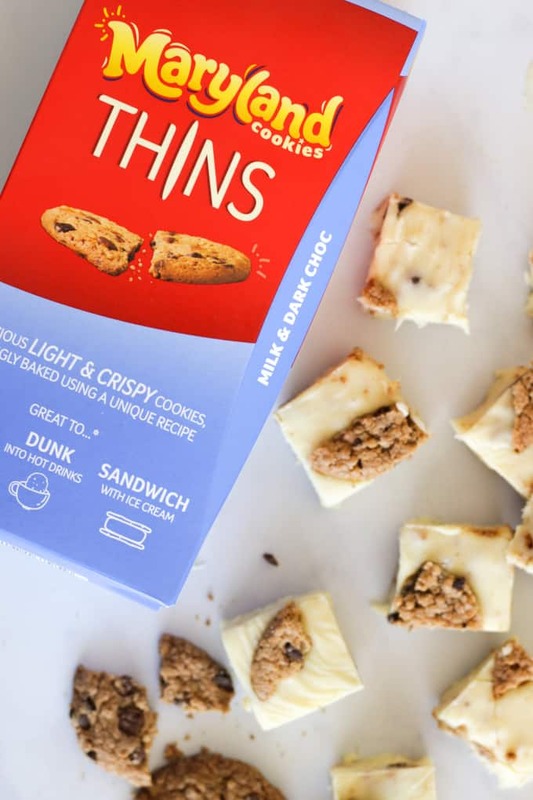 Maryland Cookies have brought out a new cookie, a thin version of their much loved treat. 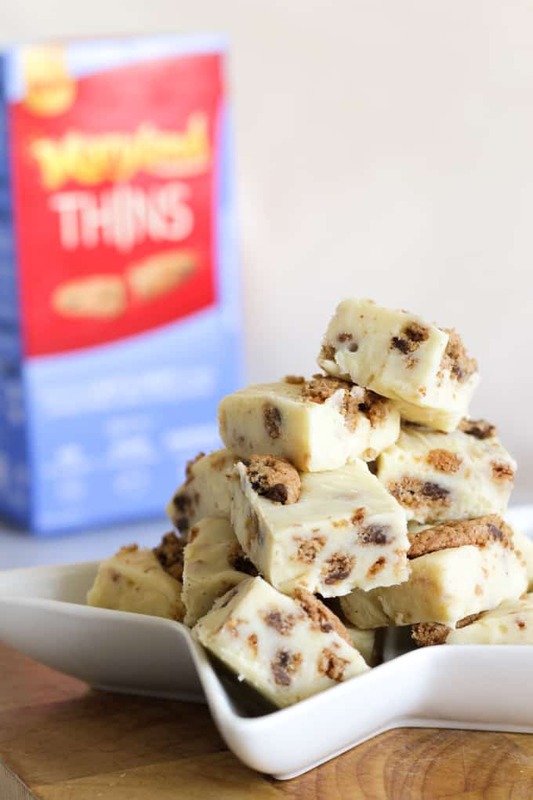 The Maryland Thin Cookies are available in two flavours, Milk & Dark Chocolate Chip and Salted Caramel. They are perfect for anyone looking for a lighter sweet snack, that isn’t too filling. They sent me some to try and I knew they would be perfect to use in a fudge recipe, without making it too bulky. I used the Milk & Dark Chocolate Chip version here, but you could use whichever you fancy. 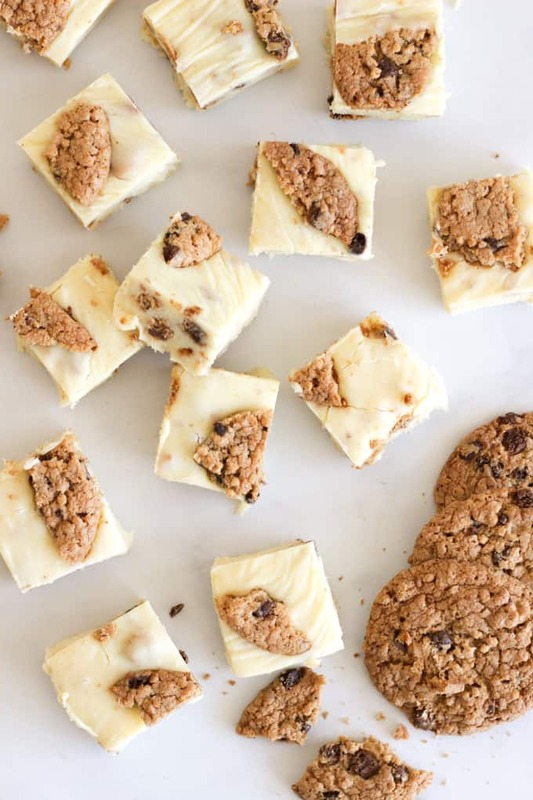 How delicious do the little chunks look on top? 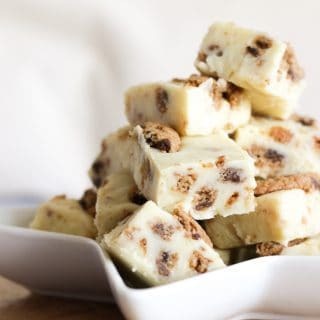 They give the fudge a great texture and make for that classic cookies and cream taste. After having many slow cookers over the years, the one I have at the moment is without doubt my favourite ever. I love the fact that the pot is so light, so that I can really easily lift out a pan full of fudge without any problems. Oh and it’s a bargain too! You can buy it on Amazon here: Morphy Richards Slow Cooker. 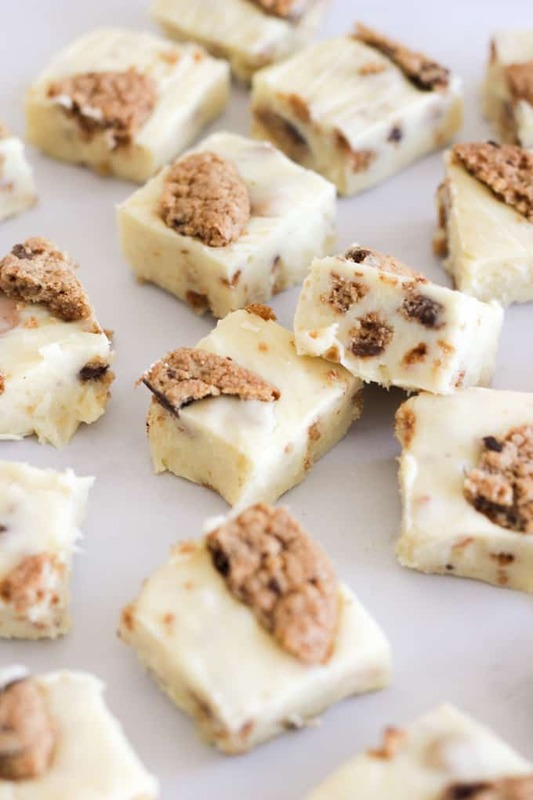 This Cookies and Cream Slow Cooker Fudge recipe is definitely on my festive food planning list! What will you be making this winter? Depending on your particular slow cooker, this may take less time. As soon as it is thick and silky smooth looking, it’s ready. You can add extra flavourings if you’d like, like this amazing vanilla extract (it’s THE best!). Pop the chocolate (broken into chunks) and the condensed milk to the slow cooker. Cook on LOW for 40 minutes, stirring every 10 minutes. Add half of the box of cookies, crumbled into small chunks. Pour into a pan lined with baking paper and smooth out the top. Press the remaining cookies, broken into pieces into the top. 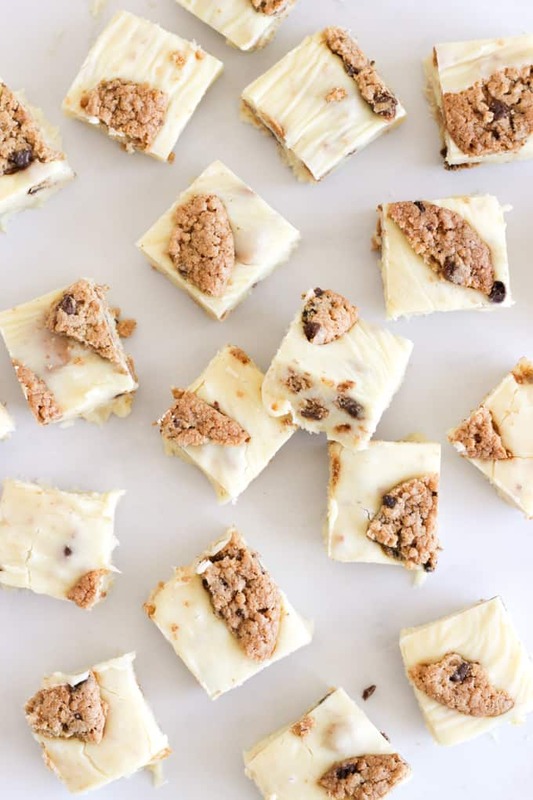 Refrigerate overnight and then cut into chunks. Disclosure: This post was sponsored by Maryland Cookies. As always, all opinions are truthful. This post contains affiliate links. Oh, you are awesome, I love this recipe and Maryland Cookies are bought by the packet here as kids love them. OMG this is AMAZE! I love my slow cooker and this looks so easy to do- the kids are going to worship me (or you) for this!